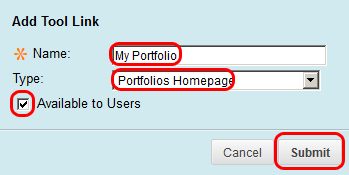 This document provides an overview of how to add the "My Portfolio" homepage to your course. If you are requiring students to work on a portfolio throughout the semester, consider adding a link to the Portfolio homepage directly in the course. From the Course Menu, click on the + above the Course Menu. Type Course Portfolios or another title in the "Name" box. Click "Available to Users" check box. 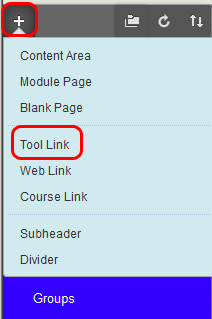 The link will appear at the bottom of the Course Menu. Drag and drop the link to a location of your preference.